How odd to think that a couple of months ago I wasn't going to enter this race. I'd run it every year since 2005, and I was bored. It's busy, I thought to myself. Then, on impulse I entered. I'm so glad I did, for I finished in 54:30 a time two and a bit minutes faster than last year's. This is the first time for several years that my performance has improved, and gives me tremendous hope. So today I found myself, with Michael Martin (aka @CILIPQuals on Twitter), pictured here (he's the fast looking one) and around 2,500 others on Brighton seafront, on a cold and grey morning. One can divide the race up into three phases: the run east to Blackrock, the long slog from Blackrock westwards to the King Alfred Leisure Centre, and the final eastwards run to the finish. And for each of these phases I felt discomfort of a different sort. Before the start and for the first section, I felt light-headed and dizzy. I attribute this to over-zealous use of my asthma inhaler before the start. Then, headed for Hove, as we passed the Peace Statue, my legs began to feel heavy and my feet hurt. I 'd kept up a good eight-minute mile pace until then, but looked at my watch to see I had slowed to 9 minute miling. 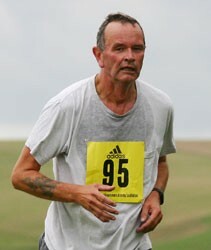 I was not in the position of one of my fellow runners though, who I heard importuning random spectators to massage him. The turn at the Hove end is psychologically important. I reminded myself of Zhukov's armies which, after the battle of Stalingrad, didn't stop till they reached Berlin. But, a mile or so before the end, I began to feel pain in my Achilles tendon. This is unusual, and I was worried. On I pressed, and that pain was joined by a nasty sensation in the groin. At my age, any sort of sensation in that area is unusual. Fortunately none of this stopped me and I made it to the end, though without the sprint finish I can sometimes pull out of the bag at the end of a race. You can see my progress on Gamin Connect at http://connect.garmin.com/activity/57424304. Michael finished 212th in 39:35, a PB for him, and I heard of other PBs, including Claire Brooks of the BSMS lunchtime runners in 42:53 and Adrian Campbell of the Seaford Striders. Six years ago to the day I started running again, after more than ten years abstinence, on the muddy path at the back of the University of Brighton's Falmer campus. I'm still running, and am overjoyed to find that my new job has lockers and showers, so lunchtime running, and therefore proper training for next year's Brighton marathon is feasible. While at the weekend greater athletes than I took themselves to New York, I ran twice over Seaford Head, on Saturday by the short route, on Sunday by the longer one which gives a 5.6 miles trip, taking in the muddy paths along the Cuckmere estuary. I didn't run today, though I went for a short reconnoitre, to see if I could find the canal near here which promises to be a good place for a run. I believe it to be the same one that Lee Rourke uses in his recent book, The Canal. I could not find it today, but will check on a map.